Almost daily the CO2 Science site brings reports on the impact of climate change on the living world. 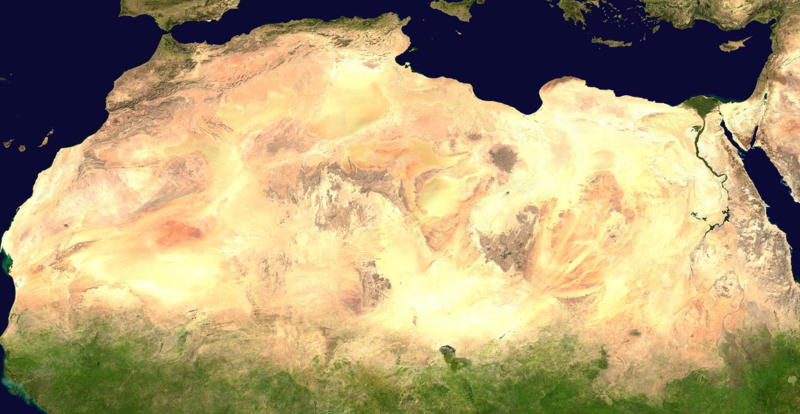 Recent study by Venter et al finds that the Sahara has shrunk by 8% over the past three decades. NASA image, public domain. According to Wikipedia, the Sahara covers a vast area of some 9.2 million square kilometers. Eight percent of that translates into more than 700,000 square kilometers. That’s an area that’s almost as big as Germany and France combined! This is profound. In other words, it’s well over 10,000 Manhattans! If the added green area were effectively used for agriculture, it could produce enough food to feed the African continent. Unfortunately, this is a fact that the doomsday-obsessed media, activists and ruling politicians fear will become publicly known. They instead would prefer that the globe returns to a climate of the 1980s, when drought and famine ravaged the vast North African region. While global deforestation induced by human land use has been quantified, the drivers and extent of simultaneous woody plant encroachment (WPE) into open areas are only regionally known. WPE has important consequences for ecosystem functioning, global carbon balances and human economies. Here we report, using high-resolution satellite imagery, that woody vegetation cover over sub-Saharan Africa increased by 8% over the past three decades and that a diversity of drivers, other than CO2, were able to explain 78% of the spatial variation in this trend. A decline in burned area along with warmer, wetter climates drove WPE, although this has been mitigated in areas with high population growth rates, and high and low extremes of herbivory, specifically browsers. These results confirm global greening trends, thereby bringing into question widely held theories about declining terrestrial carbon balances and desert expansion. Importantly, while global drivers such as climate and CO2 may enhance the risk of WPE, managing fire and herbivory at the local scale provides tools to mitigate continental WPE. Read more at CO2 Science. Another element that is unmentioned is the fertilization effect of the added CO2 into the atmosphere surely provides. This is positive news that no one will find in the Relotian mainstream media, which are fixated on purveying propaganda, falsehoods, half truths and censorship with the aim of distorting public opinion and vigorously marginalizing dissenting views.